I know that the mirror glass has been discontinued by BMW, but i'm trying to find out what type of glass is used in the after markets mirrors. Is it a flat glass or convex? On both Motorworks and Motobins websites there is no mention of the glass shape, but both sites use the BMW Part No. 46 63 2 307 640. I want a convex mirror and not a flat one. Can anyone help? I purchased a pair of mirrors on the Germany ebay site a few years back. The glass was from an after market company and it appeared to be flat. That was contrary to what had been described so I contacted the seller. He (she?) responded that it was indeed convex. I had a closer look and verified that to be true, but it was only ever so slightly convex. Go to a motor wreckers and buy a couple of convex mirrors larger than what is required. Remove the glasses and take them to a good glazier along with your old mirrors or a cardboard pattern. If he is any good he can cut them to size and finish off the edges. A few inmates have had this done sucessfully. @MartinW wrote: Go to a motor wreckers and buy a couple of convex mirrors larger than what is required. Remove the glasses and take them to a good glazier along with your old mirrors or a cardboard pattern. If he is any good he can cut them to size and finish off the edges. A few inmates have had this done sucessfully. I had one made that way. Worked great and only cost $20. I do have some brand new ones(with base and clip) at home which I bought out of a business closedown. I am willing to part with a couple but not willing to give them away. As the German ones are 88 Euro, I'd be willing to accept $110 with postage included to Brisbane. Would buy a mirror (€5) and a cutter (€5) take the old mirror from the holder and glue the new one in. What I always want to do is to buy mirrors from a french car and cut them to fit the K100. The outside 1/4 of the mirror is really convex and it gives you a good view of a car driving beside you. The other 3/4 is still convex, but with less of a wide angle view. There is not cut on the mirror, and it's made in one solid piece. If you find a car with a mirror big enough to be cut and fitted on the K bike, you will be a happy camper. And.... if this is from a car with the LED indicator for flashers or "dead angle" view, you could wire it to your flashers and have a friendly reminder that flashers are ON. I used the above company for my k100rs mirror and pleased with it. I saw them years ago, but the cost was something like 60 euros each. This is a great deal but they are for the RS and not the RT. @Arlina wrote: It's all flat glass. I’m not familiar with 1100 but is the LT same as RT fairing? The plastic bases are different between RS & RT/LT, which is why you can't simply fit an RT Mirror into an RS. All of the replacement ones I acquired are convex Rick. This is what I was thinking but wasn't sure. I will order a set. I will be particularly good for the side of the chair (There is a wide angle to cover). These are sold as aspherical mirrors. An aspherical mirror bulges more to one side than the other, creating two zones on the same mirror. The inner zone (the section nearest to the rider) has a nearly perfect spherical shape, while the outer zone (the section farthest from the rider) becomes less and less curved toward the edges. The outer zone of this aspherical design also produces a similar distance and size distortion seen in spherical convex designs. To make the explanation easier, you can compare this type of mirrors to bifocal glasses. The best mirrors would be aspheric-convex with a blind spot section. I cannot figure if the one on Ebay are this style, and cannot see where to ask the question. They could be flat with only the outer section aspherical. 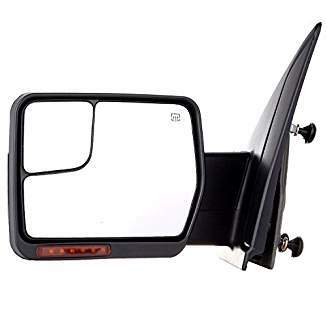 Is the line on the mirror marking the separation between the regular part and the blind spot section? Anybody speaking German would be willing to ask this question to the vendor for me? Here is the type of mirrors that I am looking for, and the ones on Ebay could very well be this type. @Crazy Frog wrote: Is the line on the mirror marking the separation between the regular part and the blind spot section? The details are really within the definition of aspherical and the product's graphic depiction. The product is being sold as an aspherical (asph in German) mirror. An aspherical vehicle mirror is—as you have described—a convex mirror that has a decreasing radius toward its outer edge to expand its field of view—there is no flat surface. The eBay mirror's surface with the decreasing radius is within the area marked by lines 9, 10, 11 and 12 on the graphic depiction of the mirror in the ad. The eBay mirror should reflect an image of proportions similar to the image on the right hand side of your example. The demarcation line between the two surface areas will likely be faintly visible—also as in your example. If you can't trust an eBay seller, is there any hope left? I sent an Email to the company and already received a reply. Yes, aspherical, 70% convex with approximately 30% further bend to cover dead angle. The US Federal Motor Vehicle Safety Standard 111 and the Canada Motor Vehicle Safety Satandard 111 require the driver side mirror to provide "unit magnification", i.e., an undistorted 1:1 reflection achieved with a flat mirror. This is cannot be achevieve with aspherical mirrors. This backup Rick G statement: "You will find that it is flat glass or convex depending which country it was sold in." To comply with this legislation, some N.A. aftermarket mirrors are approximately 70% flat and only the last 30% is aspherical. This is why I was wondering if the mirrors on Ebay are flat or convex. US manufacturers like Ford equip some of their vehicles with a split mirror. The small top mirror is aspherical and the bottom one is flat. This is an improvement, but it's distracting when you have to look at 2 physical mirrors at once. Another flaw in the north American laws is that they do not require the external mirrors to be folded. ECE Regulation 46 requires that side mirrors be mounted such a way that they swing away when struck by a test cylinder meant to represent a pedestrian. This is the reason why the K bikes mirrors will "unhook" from the fairing when you hit them. @Crazy Frog wrote: I sent an Email to the company and already received a reply. Is it auto rearview mirrors you're interested in replacing? The US federal standard allows either flat or convex mirrors on motorcycles as long as they meet the required dimensions. @Laitch wrote: Is it auto rearview mirrors you're interested in replacing? The US federal standard allows either flat or convex mirrors on motorcycles as long as they meet the required dimensions. Each motorcycle shall have either a mirror of unit magnification with not less than 8065mm of reflective surface, or a convex mirror with not less than 6450 mm of reflective surface and an average radius of curvature not less than 508 mm and not greater than 1524 mm, installed with a stable support, and mounted so that the horizontal center of the reflective surface is at least 279 mm outward of the longitudinal centerline of the motorcycle. The mirror shall be adjustable by tilting in both the horizontal and vertical directions. An important point is that they are not mentioning anything about aspherical, but only convex. They also are talking about average radius. Is the aspherical type fitting this requirement? Why don't we find any aspherical mirrors on car or motorcycles in North America? 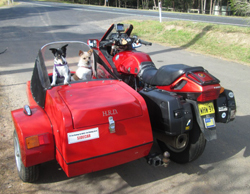 Yes, the law is different for motorcycles:Is the aspherical type fitting this requirement? Yes, aspherical type fits this requirement covering motorcycles. An aspherical mirror is a convex mirror—a type of convex mirror. Why they might not be widely found on motorcycles in the US yet is because this allowance is new regulation developed in the February 2018 federal revision. Passenger cars are still required to have unit magnification outside on the driver's side. @Laitch wrote: Why they might not be widely found on motorcycles in the US yet is because this allowance is new regulation developed in the February 2018 federal revision. OK, this is very new. Earlier this year, I was reading an article about US considering allowing convex/aspherical mirrors on driver side (for cars), but I don't think a decision has been taken yet. Both of my K100 are ECE market and in 1985, they were already fitted with convex mirrors. One was bought in Canada and the other in the US. I am wondering how they got approval with DOT. 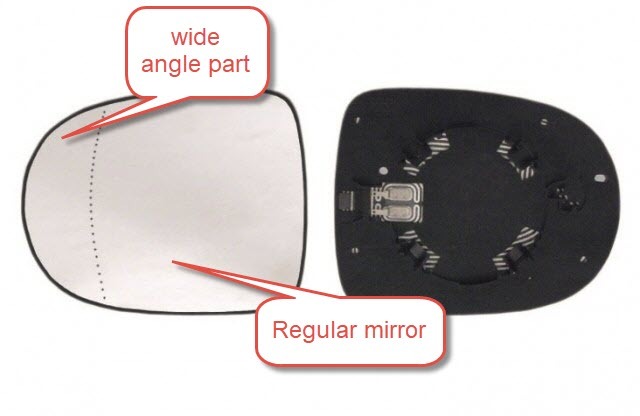 As an aside to this topic, years ago, when looking up replacement mirror glass for BMW R1100RT models, there'd be two listings with a production date split. One was described as 1100mm and the other as 1400mm. This was obviously not related to the size of the glass. For the R1150RT there was only ever the 1400mm listed. Both "sizes" fit all mirror pods. One was more magnified. By way of interest I note that now only the 1400mm is listed in ETK for both R1100RT & R1150RT. Perhaps a regulatory change influenced that.